As part of the 18th International Book Fair, a press conference on “Orthodoxy-book and cinema” was held. The exposition of the multi-volume edition of the Orthodox Encyclopedia. Panorama of the books: "Monologue of the Patriarch", "Earthly and heavenly", etc. Participants of the press conference. 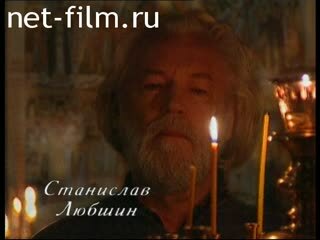 Fragments of the documentary television series "Earth and Heavenly" (Valery Zolotukhin, Stanislav Lyubshin, Vladimir Ilyin). City of Rome: Collisea building. Yuri Solomin - theater and film director, actor, public figure of Russia.